Take a look at these dishwashers. See anything different? You are looking at the truly novel Fisher & Paykel double drawer dishwasher (far left). It looks cool and is convenient with the drawer at waist level. But is it worth buying? We will look at the company, the product and then review it at the end. I have perspective, because I used to own one of the earlier models. Fisher & Paykel is based in New Zealand since 1934. Their first product was a refrigerator through a partnership with Crosley and later Kelvinator. In the 1950's, they invested in technology to differentiate themselves from other brands. 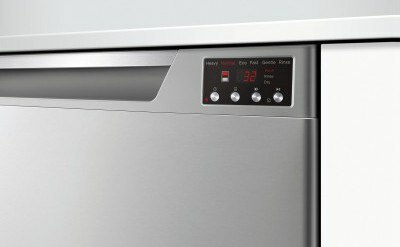 Today, Fisher & Paykel is the most unique appliance company on the market. However, Fisher & Paykel made a name for themselves in 1997 at a trade show in the U.S. 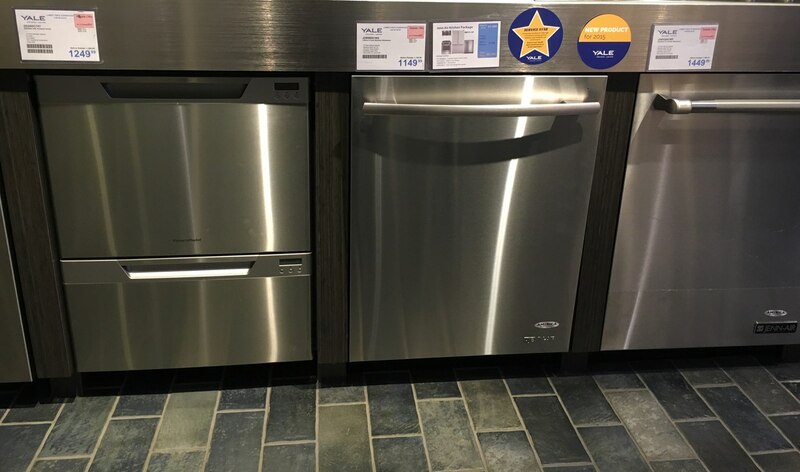 They introduced the first double drawer dishwasher. It was the most innovative at the time and featured a detachable DC motor, which could be completely removed for service. The main attraction was its uniqueness, but like most new products it had service issues. There have now been 8 different design changes. As of 2014, the product was tied with Bosch as the second most reliable after Miele. The biggest change is the aesthetic. Fisher & Paykel is going with a singular control panel for a better fit and finish as well as one less part to break. A fan assist drying in front of the unit which pulls ambient air out of the unit for an effective and extremely efficient drying cycle. The SmartDrive technology is a new brush-less DC motor that acts as a wash pump and drain pump, which means less moving parts and greater reliability. 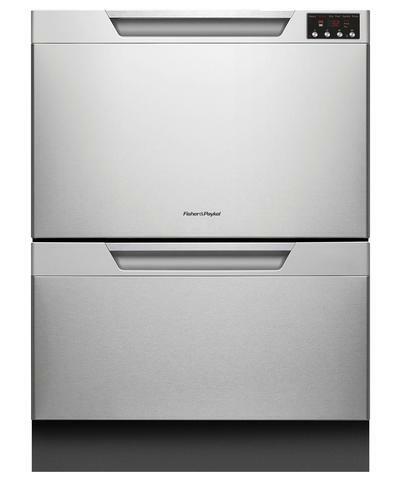 The Fisher & Paykel DishDrawer barely uses 276 kwh/yr or about $33 a year to operate (based on using 4 wash loads a week). Each drawer uses as little as 2.4g per drawer. Normal cycle duration is 128 minutes, but a fast cycle can be as quick as 55 minutes. Bigger families (4+) will not benefit from the DishDrawer. Each drawer will not hold enough for family capacity. You will need to use both drawers. Smaller family or emptynester household will certainly take advantage of the dish drawers. Why does an energy efficient dishwasher take 2-3 hours to wash? Well, dishwashers have smaller pumps and lower spray volume than the older dishwashers. Longer cycle times, coupled with enzyme detergents to dissolve food soils, are required to maintain cleaning performance. Smaller pumps and less aggressive spray is also a factor in promoting quiet operation. Even with longer operating times, less energy is used than older units. Fisher & Paykel's main issue for years was reliability. Over the last few years, they have dramatically reduced incidents of service. Fisher & Paykel is also now warrantying the product for three years. I think Fisher & Paykel DishDrawers have a good niche in this market. If they can keep their service record low, you should certainly consider the DishDrawer. Sometimes it is nice having a unique product in your kitchen. 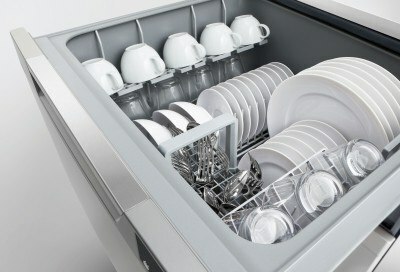 Read our Dishwasher Buying Guide for features, specs and inside tips on all brands of dishwashers. Over 110,000 people have already read a Yale guide.